Microsoft integrated Adobe Flash natively in newer versions of the Windows operating system so that the built-in web browsers Internet Explorer and Microsoft Edge can make use of it automatically. 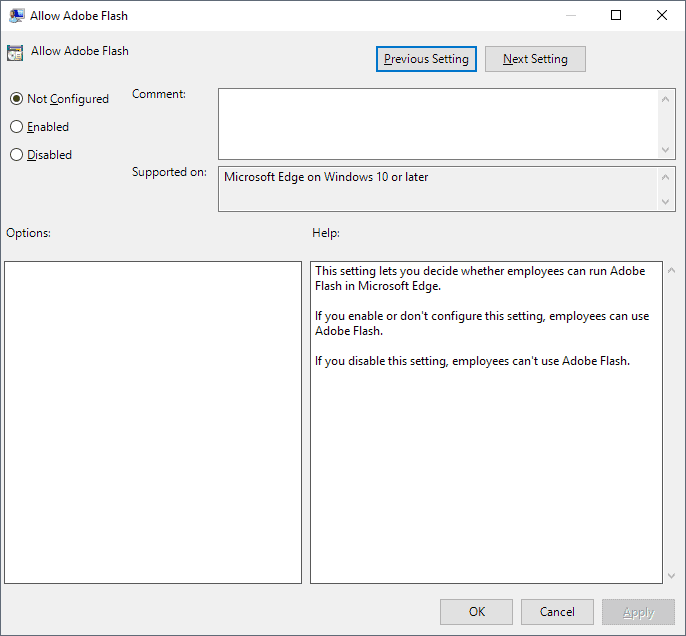 The approach offers some benefits: first that Microsoft is in charge when it comes to updates for Adobe Flash, and second that the browsers are compatible with Flash content out of the box. The downside is that Flash is not really super-secure as vulnerabilities are discovered regularly that require patching. While the patching is out of the hand of users, it still means that the integrated version of Flash has vulnerabilities. All of that will change in 2020 when Adobe retires Flash. Up until then though, Flash will remain integrated in Windows 8.1 and Windows 10, and it is up to the user or administrator to deal with it. The operating systems come without option to uninstall Adobe Flash. The only option that is provided is to disable Flash in the browsers or using system tools. While there are workarounds available to remove the built-in Flash entirely from a Windows machine, it is recommended that most users don't make the required modifications as it includes having to make changes to the Registry and using dism to remove packages. You can check out the instructions on the Ask Woody site if you are interested in removing Flash completely. 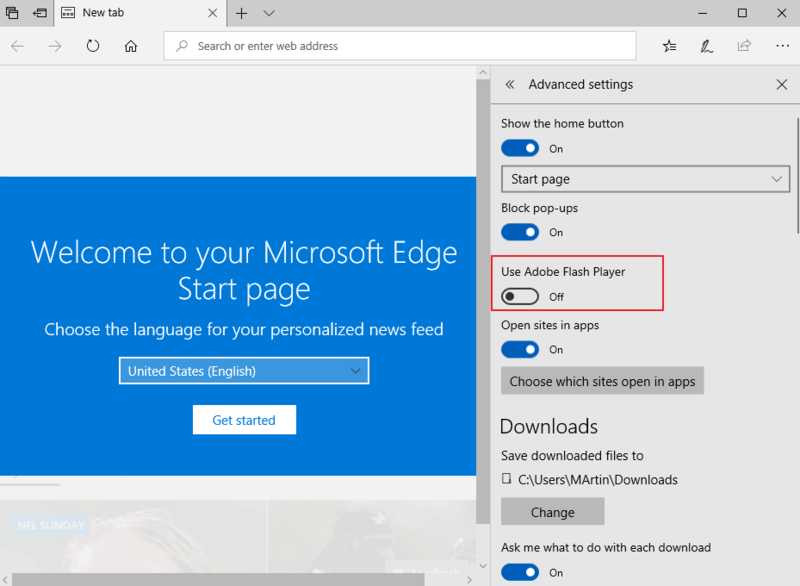 Microsoft Edge is the default Windows 10 web browser and it comes with built-in Flash support and an option to turn off Adobe Flash. How that is done depends on the version of the operating system that is installed. You can check the version of Windows by running winver from Start. Open Microsoft Edge on the device. Select Menu (the three dots) and then Settings from the context menu. Scroll down and click on "view advanced settings". Toggle "Use Adobe Flash Player" near the top of the new page so that its status is set to "Off". Tip: you can undo the change at any time by setting Flash Player in Edge to On again. Microsoft changed the layout of Edge's Settings interface in Windows 10 version 1809 (The October 2018 Update). Load the Microsoft Edge web browser on the device. Select Menu and then Settings. Select Advanced from the list of categories. Toggle Use Adobe Flash Player so that it is set to Off. Administrators may configure the "Allow Adobe Flash" policy to disable Flash on the system using it. Please note that the Group Policy Editor is only available in professional versions of Windows 10 (basically, in all versions but Windows 10 Home). Type gpedit.msc and load the suggested result. Doing so starts the Group Policy Editor. Go to Computer Configuration > Administrative Templates > Windows Components > Microsoft Edge. Double-click on "Allow Adobe Flash". Note: You can turn off Adobe Flash for users under User Configuration > Administrative Templates > Windows Components > Microsoft Edge. 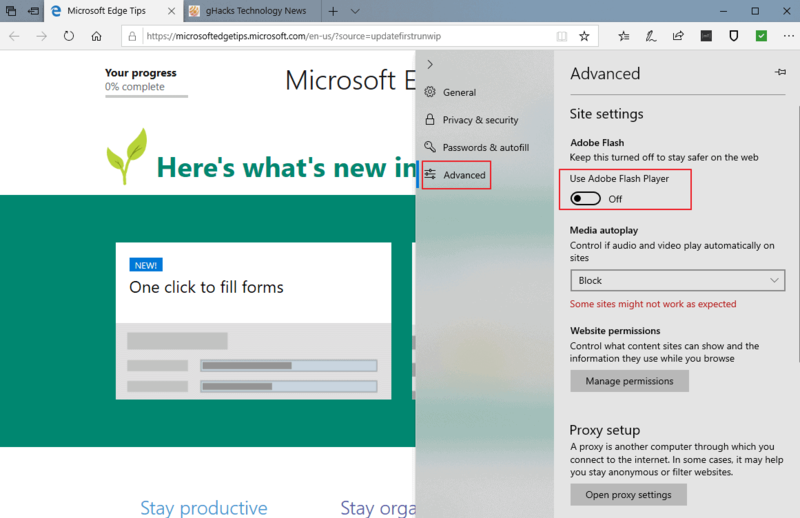 Admins and users can turn off Adobe Flash support in Microsoft Internet Explorer and in applications that use IE technology. Open the Group Policy Editor as described above. Go to Computer Configuration > Administrative Templates > Windows Components > Internet Explorer > Security Features > Add-on Management. 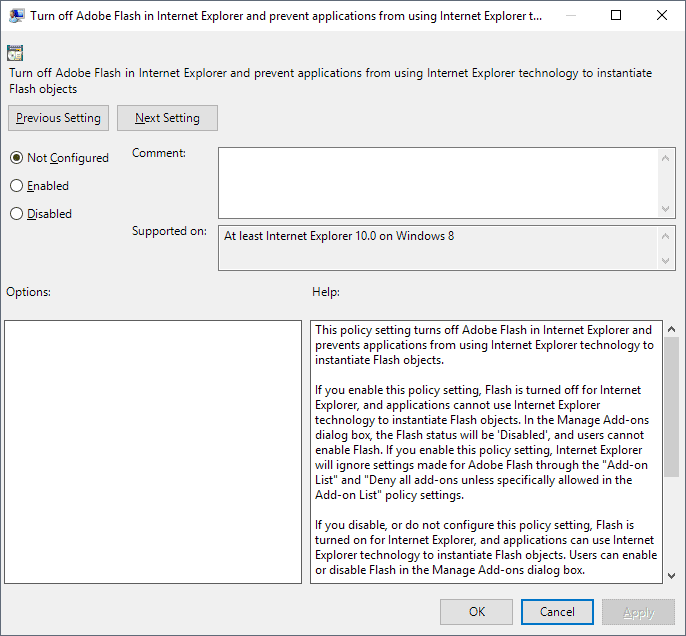 Double-click on "Turn off Adobe Flash in Internet Explorer and prevent applications from using Internet Explorer technology to instantiate Flash objects". Set the policy to "Enabled". Note: You find the same policy under User Configuration as well: > User Configuration > Administrative Templates > Windows Components > Internet Explorer > Security Features > Add-on Management. Günter Born highlights another option to disable Flash in Internet Explorer that requires editing of the Registry. Find out how to disable the integrated version of Adobe Flash on Windows 8.1 and Windows 10 systems that Internet Explorer and Microsoft Edge use. Yes, I was wondering why that option wasn’t mentioned in the article. I’ve had it disabled in IE11 using the same means for as long as I can remember. What I hated about Edge is how barebones the settings are and the customization is almost non-existent. Ooh, there’s a DISM solution! I was not aware of this. WIll try it on my LTSB 1607 VM later. Hope MS will not include Flash on LTSC 1809. Haha, it’s gone! :) LTSB 1607 x64 has only two Flash related packages by the looks of it. I think it doesn’t have the WoW64 one, at least I can’t see it anywhere. Maybe because I have IE disabled..? @nosamu – gpedit.msc overrides the IE settings. An update to IE can re-enable a setting you’ve disabled within IE. Is there a way to block all web site with flash player and whitelist a sever of sites? I typically just disable Flash through browser settings. That way if for some unique one time need for Flash I can just enable. Although that has become fewer and fewer times. For one example the National Weather service by default still likes Flash player for some map loops. Really time for them to move past that but like any big organization advances move very slowly.